Nestled in between California and Nevada, the pleasant and serene locale of Lake Tahoe has drawn in people seeking recreation, relaxation, and adventure for many generations. Here, you can gaze into the crystal-clear depths of America’s biggest alpine lake—as well as its second-deepest lake overall—while partaking in fun-filled recreation all year long. Browse our Truckee and Lake Tahoe vacation rentals to find the best place for your next vacation. Race down the fluffy, white mountain slopes or take an invigorating trek through the snow-covered pines in the winter. In the spring and summer, hit the water by boat for huge catches of trout and salmon, or for exhilarating jet skiing sessions. No matter what season you decide to plan your stay in Lake Tahoe, we guarantee that you’ll never run short of things to do and see during your visit here! 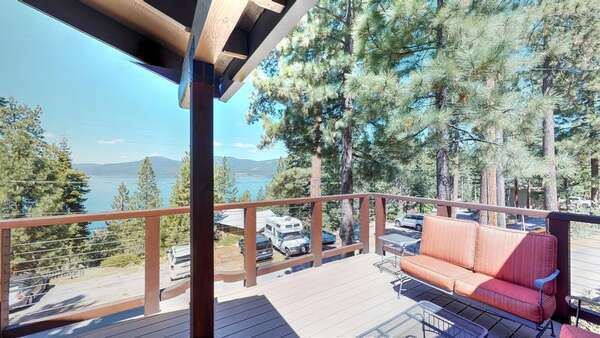 Browse below to find the perfect vacation rentals Lake Tahoe has to offer for your getaway! Tahoe Signature Properties has the esteemed privilege of offering only the highest-quality vacation lodgings in the entire North Tahoe and Truckee area. Our luxurious Lake Tahoe vacation rentals are fully-furnished with lavish amenities and cozy touches, in addition to being kept immaculately clean and in excellent repair so that when you arrive, all you need to think about is what you’ll do next on your vacation! Additionally, we provide professional-grade property management services such as cleaning, maintenance, and marketing to owners of amazing rentals all throughout the region. What kind of rentals can you expect from Tahoe Signature Properties? We have many different size, shapes, colors, and styles of properties, but the one key trait they all share is the sense of home. When that door swings open, the rooms beyond will envelop you with warmth and style. Rustic cabins built of wood and glass open up into a surprisingly modern décor, while still maintaining the simple beauty of wood beamed ceilings and warm wood floors. Only the highest quality furnishings and appliances will be found in these luxury vacation rentals in Lake Tahoe: stainless-steel appliances and custom cabinetry in the kitchen, oversized velvet and plush sofas and chairs in the living areas, bedrooms containing lodgepole bunkbeds topped with premium mattresses in the kid’s rooms, and more grown-up versions in the adults. Family homes with deceptively simple exteriors open into spacious and bright rooms furnished with sturdy, yet inviting furnishings that are purposely placed to allow for the best views of the stunning landscape found just outside the walls of windows. Gourmet kitchens take the drudgery out of creating home cooked meals. Bedrooms with high ceilings and more of those views provide comfortable places to rest at the end of a long day. Spa-like bathrooms designed to pamper—with a jetted tub placed in front of a lakeview window—yes, please, and thank you very much! Luxurious doesn’t have to be expensive, and simple doesn’t have to be cheap. When you stay in a Tahoe Signature Properties vacation rental in Lake Tahoe you get the best of ALL worlds! Whether your alpine trip calls for staying in a beautiful home in the middle of the scenic natural setting of Lake Tahoe, or you require the services of a management company to look after the gorgeous Lake Tahoe rentals that you already have here, Tahoe Signature Properties is the best option for all of your vacation home needs. Surrounded by breathtaking mountain views and tranquil lake waters, there is no vacation destination that can quite compare to the alpine splendor of the vacation rentals Lake Tahoe offers. It’s the ideal place to own or rent a vacation home and capture the quintessential mountain- and lakeside experience! Spend your days hiking the trails around the lake or touring Vikingsholm, a 1929 Mansion built of stone and offering tours throughout the summer. Explore the beauty of the Tahoe area on a bike you’ve rented from The Back Country in Truckee, or stop by the Old Jail Museum at 10142 Jibboom Street in Truckee and discover what life would have been like for the rulebreakers in the 19th century. The dinner you enjoy at the Donner Lake Kitchen after your morning in jail will be the sweetest you have ever tasted! Speaking of sweets, nothing says summer vacation in Tahoe clearer than a mint chip cone from Little Truckee Ice Creamery; the flavor is our favorite, but you should probably sample them all to find your own! They are closed during the winter months, but will be open again in the spring, so be patient and schedule your stay in our luxury rentals in Lake Tahoe for April! Begin planning the vacation of a lifetime when you contact our dedicated in-office team of reservation specialists to learn more about the fantastic Lake Tahoe vacation rentals that we have available for your stay, or talk to our friendly property management specialists for additional information on the property management services that Tahoe Signature Properties supplies to our homeowners to help them make the most out of their Lake Tahoe rentals investment. Call or email us today to browse the best selection of luxury rentals Lake Tahoe has to offer!